½ teaspoon salt NOTE: some folks have commented that the addition of the salt makes these too salty, so feel free to omit it or decrease the amount! Preheat oven to 350 degrees. 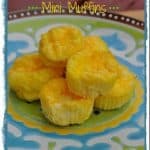 Thoroughly spray miniature muffin pan with cooking spray or grease with butter. In a large measuring cup or bowl, whisk together eggs, milk, salt, and pepper. Sprinkle cheese evenly among the cups. Bake for approximately 8-10 minutes, or until eggs set.